UPDATED to 3.1 Please Re-download and reread the functions. 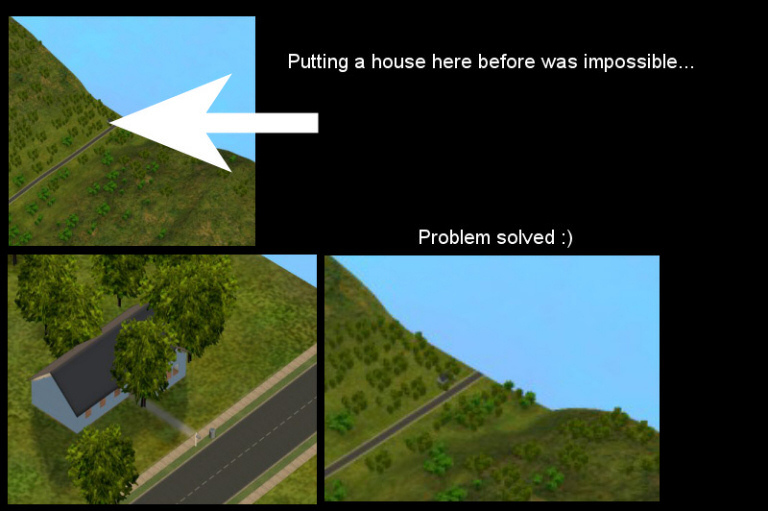 Go to the far edges of your neighborhood to place lots and objects. 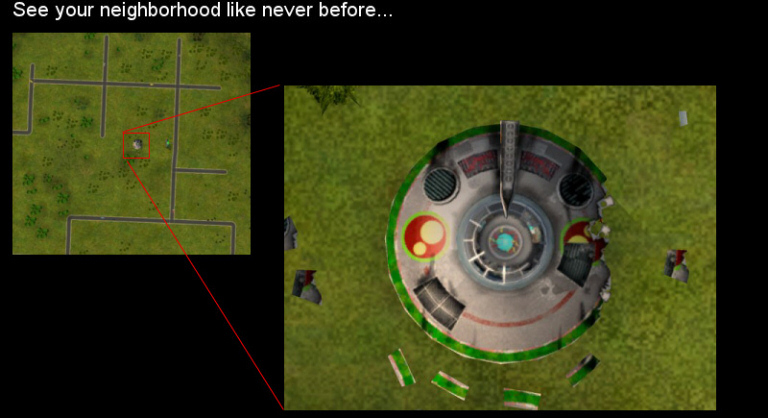 See a TOP DOWN view of your neighborhood by rotating camera. Zoom in or out farther than before. Clipping enhanced to allow extreme close ups without objects "disappearing". 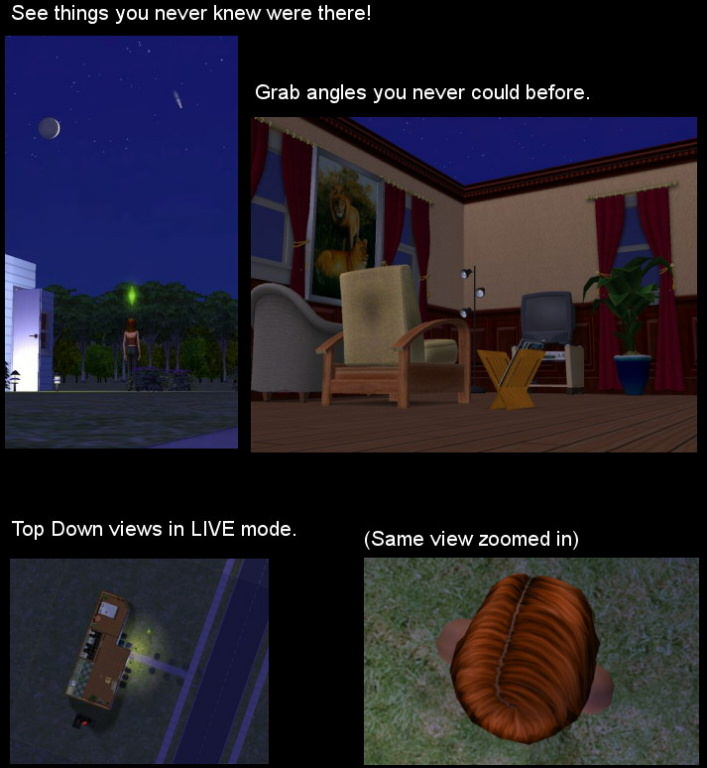 Top Down view available in Live Cam mode by rotating camera. on the highest zooms and the closer to the ground you are (Not nearly as slow as before though). This mod zooms in much closer than Maxis ever intended so this side effect is something that can not be totally removed. full zoom as when its zoomed out you wouldn't be able to control it. Zoom in when in any mode! This should now be considered High Detail Camera. No Fading, No clipping in either version. Very slow movement. This done on purpose with this cam. The purpose of this cam is for story telling, screen-shots, and movie grabs. If you follow the usage instructions below you will find this camera can be very powerful for these modes. This camera is NOT intended as a play camera. Movement is slow, zoom is slow, and placement is slow. But you can get very exact shots and movies this way. The Cinema Cam is the camera the game switches to when events happen. and RIGHT CLICK on a Sims icon. with every little movement the sim makes. If the Sim is moving body back and forth, cam will move back and forth. I tweaked it so that it doesn't do it too much, but does it enough to be convincing. Back up your My Documents\EA Games\The Sims 2\Cameras folder with either WinZIP or WinRar. if you have Mod 3.0, just extract over it. The farther you zoom in, the slower the camera. To enter Free Mode: Hit the Tab key. Camera now works like a First Person Camera. Remember this camera, by design is SLOW. This is done on purpose. 1) Use the Live Mode Cam to position the camera close to where you want it. 2) Hit TAB and enter Free Mode. 3) Now using the proper keys, position the camera where you would like it. Very quick presses of the movement keys will result in VERY small movements or zooms. Longer key presses will result in slightly quicker movement. The Camera can go as close to the ground as possible without going "through" the ground. However, If you are on a floor that has a foundation, the camera CAN go below the foundation. 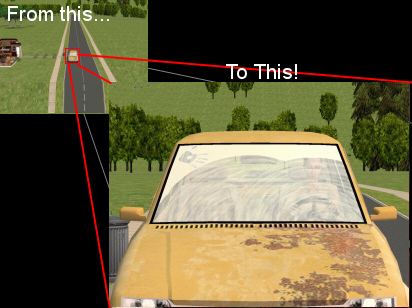 Roads do not have much clipping force, so if you are on a road piece, be aware that sometimes the camera can be placed below the actual road. Camera can now rotate all the way up (Toward the sky), and all the way down (directly under you). So if you want to get REAL close, get close. Remember, use the live camera to first get in an ideal place, then use this mode for fine tuning. Who knew that Sims 2 has 2 moons? I want to thank everyone who gave me feedback on 3.0, and esp. to xylune for pointing out a very glaring "bug"
GCM-31-A.RAR : No Fade No Clip Version. In this version, Fade does not exist. GCM-31-B.RAR : No Fade Default Clipping Version. Clipping is at Maxis defaults. GCM-31-C.RAR : Maxis Live Mode Version. In this version, Fade exists as Maxis default. Please download the one you want. You can of course, always try another mode by installing over the previous. 7418 people have said thanks to GunMod for this download.